Scott Poiley began his career in 1982 as an actor in movies and national commercials. He competed and won several national dance competitions, including Mr. Teen Dance of America and the recipient of the prestigious Presidential Scholars Award in the Arts. 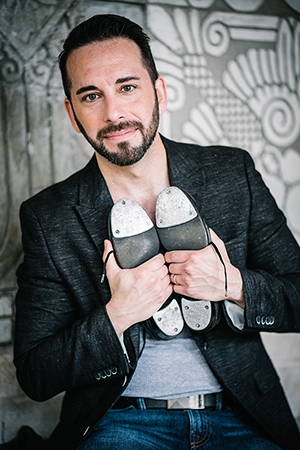 Scott’s tap mentor was Gregory Hines and he has graced the stage with Ben Vereen, Steve Condos, Jimmy Slide, Savion Glover and the world-renowned Duke Ellington Band, to name a few. His love for dance and acting led him to New York where he was cast in many theatrical roles including Joseph and The Amazing Technicolor Dream Coat and the national tour of Foot Loose. He later completed his BFA in Theatrical Studies from Niagara University and was forced to stop dancing when he found he had an enlarged heart. He channeled his creative energies into filmmaking and completed his MFA in Producing from the University of Miami. On top of Scott’s dance career, he is an award-winning writer, producer, and director. He has won several awards including the iHORROR AWARD for Best Direct Release Horror Film and the GOLDEN SKULL award for Best Supernatural Film for LAST SHIFT. Recently, he won THE CREATIVE AWARDS GRAND JURY PRIZE for his Sci-fi script VITRUVIAN. Scott began developing original feature-length content in 2013, and since then he has written and produced CASSADAGA (2013), MISSIONARY (2014), LAST SHIFT (2015), HER LAST WILL (2016). Scott wrote and directed, EXHUME (2016), MISFITS (2017), GOOSE (2017), The SECRET BOOK (2017), and The NUTCRACKER (2017). Once again, fate intervened and just as his film career was rising he was told his heart was working at 1% and he needed a heart transplant. In the summer of 2014, after a short 20 days on the heart transplant list, he was blessed with a new heart and the Dr.s told him he could dance again! Now, you will find Scott creating art through dance, music, story, and film on a daily basis. Scott is truly excited to take on his next adventure as the Executive Artistic Director for Skyra Studios where he plans to provide students with the highest level of training and real industry experience.